ALKEN, BELGIUM (BNC) — A website has been launched with illustrated Bible readings for children. It is sometimes difficult to find Bible story books that are true to the Scriptures. 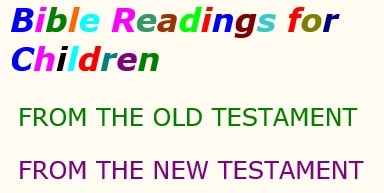 In this case, actual readings from the Bible have been selected that are suitable for children. The WEB audio recordings are available copyright-free from Audio Treasure. At launch there are only a few readings for the Old and New Testaments but week-by-week new readings are to be added by the publisher, Roy Davison. The material can be accessed by PCs, handheld devices, and by TVs with an Internet connection. Many children have their own tablets and phones with which they can listen to the readings. Sunday school teachers can use them if they have an Internet connection in the classroom. Is someone reading? I clicked it on and saw the pictures on the screen, bur no sound.